My time at the Refugio was relatively short. I traveled with a small group from St. Mark Lutheran church and was unsure what I would find when I arrived. Around Quito I saw kids who had to work on the streets to get by. I heard how children as young as 7 or 8 would have to take care of their younger siblings for up to 12 hours a day. Despite seeing and hearing all of these things when I entered the Refugio all I saw was kids being kids. Inside those walls is a place where the harsh realities and responsibilities of life outside Quito can melt away and for an hour or two these kids can play. I don’t speak Spanish. I come from a fairly privileged background. I don’t know anything about what it is like to live in the kinds of situations that each of these children spend most of their young lives in. But I do know how to play, and every day when I went to the Refugio that’s what I did. We played soccer, basketball, Frisbee, we wrestled on giant mats as “luchadores libres”. Every day I went up and played until I could hardly stand back up, only to be tackled by more kids and egged on until a new game could be started. 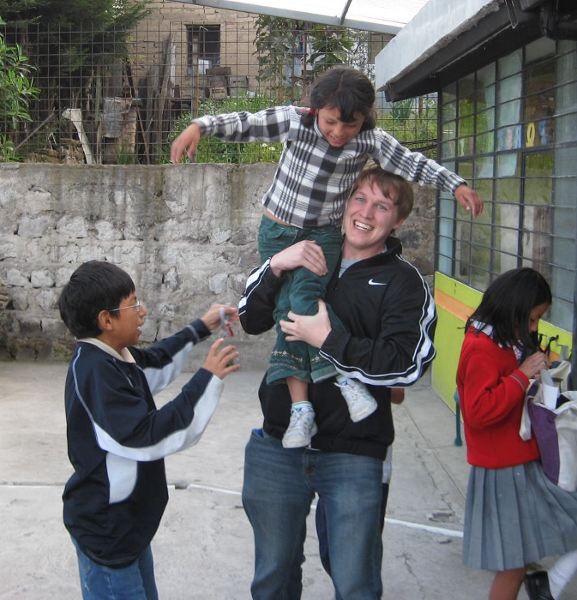 I don’t know what difference my being at the Refugio made for those kids. I hope that I was able to give each of them a few moments of fun and excitement, and a few extra moments of the kind of carefree fun loving life that every child should have. For me spending each day playing with these kids gave me incredible joy and showed me that we are all children of God and because of that we have so much more in common than we give ourselves credit for. The Refugio is a very special place run by some very special people who can and have made amazing impacts on these children’s lives simply by giving them the space and the care they need to be what they are, children of God.